Thanks to everyone who came out to the Mayerson Distribution Center last month for our Annual Meeting. What a great turnout! 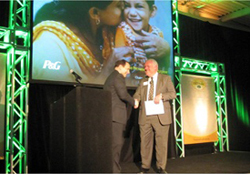 It was our pleasure to welcome P&G President and CEO Bob McDonald as our guest speaker. Mr. McDonald reminded us of the importance of finding meaning in our day-to-day work and being a part of something much larger than ourselves; to touch and improve more lives. P&G has been a great partner for more than 20 years, and we appreciate all the work they’ve done for us as we strive to help those who need it most. For those of you who were not able to make it to the Annual Meeting, we have a few videos that were put together specifically for the event. First, is the story of Rodney Clark, a former Freestore Foodbank customer. Rodney now works for us in the Cincinnati Cooks kitchen. Find out how the Freestore Foodbank was able to help change his life. This year, we are celebrating our 40th Anniversary. We think this video shows just how busy we truly are on a day-to-day basis. Thanks to everyone who attended the Annual Meeting. We greatly appreciate all of your support. We’d also like to offer up our thanks to Prestige Audio Visual & Creative Services for providing the equipment, and to Cincinnati Cooks Catering for providing drinks and hors d’oeuvres.